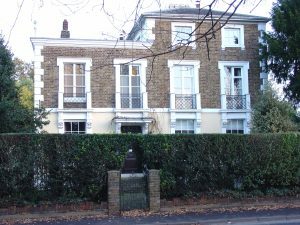 This property in High Road, Broxbourne, was the Wells family home when Charles Deville Wells was born in 1841. As most children were born at home in that era, this house was almost certainly his birthplace. Charles Deville Wells, later to achieve fame as ‘the Man who Broke the Bank at Monte Carlo’, was born in Broxbourne, Hertfordshire in 1841. He was baptised by the Rev. Francis Thackeray, the uncle of author William Makepeace Thackeray. Wells’ own father was also a literary man – the poet Charles Jeremiah Wellls.